Beethoven’s Ninth Symphony, with its use of chorus and solo voices, redefined the symphony and set a monumental and intimidating example for composers who followed. For me, one of the most amazing aspects of this music is the way it seems fully to transcend style and historical period. There are echoes of the Ninth Symphony, especially in the operatic, “wordless” violin recitative which forms the bridge between the fourth and fifth movements (36:10). In the final movement of the Ninth, Beethoven quotes the themes of each preceding movement, musically rejecting each and moving forward with the transcendental “Ode to Joy.” In a similar way, with these quartets, Beethoven moves past all of his earlier works into strange, new musical territory. Go back and listen to the third movement (17:24) one more time. Having recovered from a serious illness, Beethoven titled this movement “A Convalescent’s Holy Song of Thanksgiving to the Divinity, in the Lydian Mode.” The music abruptly alternates between slow, chorale like sections in modal F and faster sections (“with renewed strength”) in D. At times there is an almost child-like playfulness. It’s powerful music which goes beyond words. Here is the Takacs Quartet performing the mind-blowing Great Fugue, Op. 133. 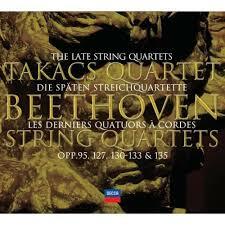 Beethoven originally intended it to be the final movement of Quartet No. 13. He ended up replacing it with another movement. After you listen, you’ll probably get a sense of why this intense music had to stand alone. Listen to the complex imitative counterpoint. What do you think Beethoven is saying with this music? I am so glad ONE other person understands what Beethoven is doing in the “lost” first 6 1/2 minutes of the 4th Movement of the Ninth. I had a video on UTube some time back where I explained this in detail but with several million hits, not one person understood, and in fact many said I was insane.